Ruffled curtains add a charming, warm touch to any room of the house, and the weight of ruffles helps curtains hang better. The ruffle on a curtain usually extends along one side and across the bottom. In the directions that follow the curtain is hemmed after the ruffle is attached, and the ruffle extends into the casing and heading. 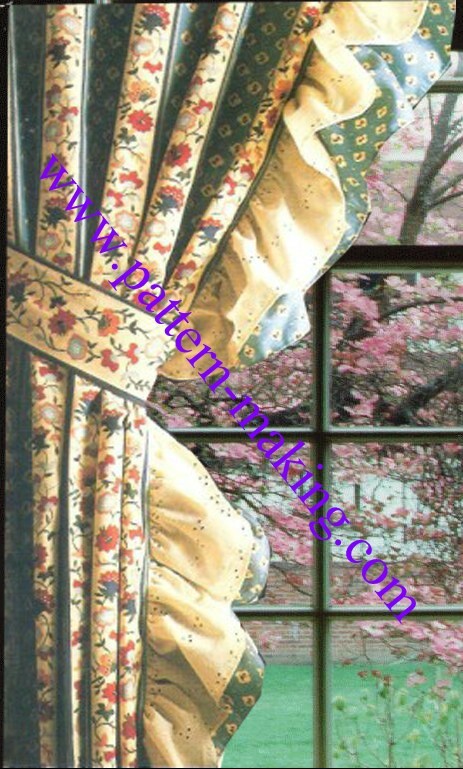 A coordinated shirred valance may be added for a decorative touch. Ruffle fullness depends on fabric weight and ruffle width. 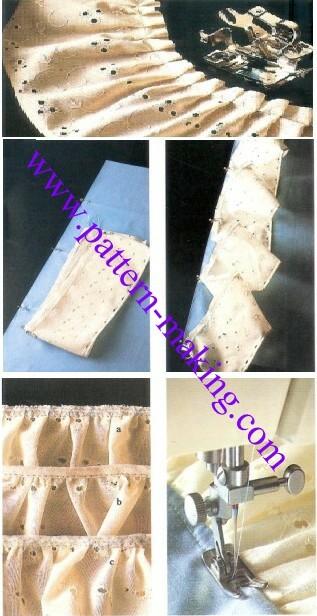 Sheer fabrics usually need triple fullness; crisper fabrics need only two or two and one-half times fullness. Wide ruffles should be fuller than narrow ruffles. You will usually need to purchase less additional fabric when ruffles are cut on the crosswise grain. If ruffles are cut on the selvage, use the selvage edge in the seam. Hem the edge of the ruffle before gathering. Single ruffles are one layer of gathered fabric with a hemmed edge. Narrow ruffles should have a hem no wider than 1/4″ (6 mm). Double ruffles require a double width of fabric which is folded in half, wrong sides together. The folded edge eliminates the need for a hem. Because of the extra bulk created by two layers, it is best to make double ruffles from lightweight fabrics. The zigzag stitch, the ruffler and the narrow hemmer can speed up the task of making ruffles. Begin by cutting the fabric the appropriate width for a single or double ruffle. Then seam sections together at the short ends to make a continuous length, using plain seams for double ruffles and French seams for single ruffles. Hem one long edge of single ruffles, either by machine-stitching a double-fold 1/4″ (6 mm) hem, or by using a narrow hemmer. Zigzag over a strong, thin cord on wrong side of fabric to make long ruffles easier to adjust into even gathers. Use cord, crochet cotton or dental floss, placed 3/s” (1 cm) from raw edge. Use wide zigzag stitch so cord does not get caught in the stitching Use a ruffler attachment to tuck or gather as you sew. Make a test strip and adjust ruffler to desired fullness. Measure the test strip before and after stitching to determine length of fabric needed. Omit steps 1 through 3 (opposite) when using ruffler. 1) Divide curtain edge into equal segments; mark with pins. Divide ruffle strip into same number of segments. 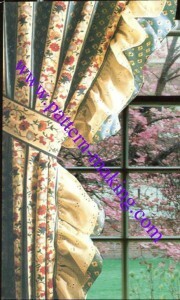 Allow extra fullness in segments to be placed at corner, so ruffle will lie flat in finished curtain. 2) Pin the ruffle strip to the unhemmed edge of the curtain, right sides together; match marking pins on the ruffle strip to marking pins on the curtain edge. 3) Pull up gathering cord until ruffle is same size as edge of curtain. At lower edge, release gathers the depth of hem. At upper edge, release gathers the depth of casing and heading 4) Pin in place as necessary to distribute gathers evenly. Stitch a ‘/2″ (1.3 cm) seam, gathered side up, controlling gathers with fingers on each side of the needle. 5) Trim seam allowances and over edge using zigzag stitch, or encase seam with double-fold bias tape (b), or encase seam with lightweight bias tricot strips 6) Press seam toward curtain. Topstitch on curtain side 1/4″ (6 mm) from seam so ruffle will lie smooth and even. Stitch hem and casing. Ruffle is gathered on right side, but flat on wrong side.